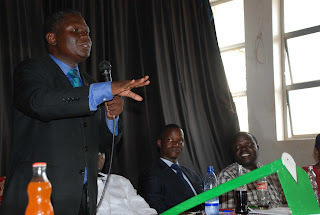 PRESIDENT Norbert Mao has explained the reason why the Democratic Partybacks Socio Democratic boss Micheal Mabikke for the Kampala Mayoral race. HE said Mabikke was not his first choice but the defiance of Erias Lukwagoand his failure to follow party rules forced the party to back Mabikke.“When a beautiful woman refuses to take your marriage proposals, you don’tgive up with marriage as a man. You look out for one who is medium becauseyou have to marry. Our party has full support for Michael Mabikke andeveryone should vote for him as mayor,” Mao said over the weekend.Mao said Lukwago was variously contacted to nominate as DP but he refusedand instead said if the party wanted, they take the party symbols to hishome.HE argued party, members to abide by their constitution to avoid rifts thatwill result in time wasting. “When you look at time wasted with Suubi, youcount a lot of waste. We wasted a lot of time in the useless court casesover our election because someone wants to antagonize the party. We need tofocus ourselves to winning the elections and fetching votes,” Mao said.Mao dismissed talks of intrigue in the party as Lukwago moves aroundblackmailing it.“If we were working on intrigue, then Betty Nambooze who has been at thehelm of criticizing our activities would not have been nominated on the DPticket,” Mao said.He was at Christ the King meeting Buganda leaders who he argued to researchissues relevant to their electorate.THE party chairman said they made several attempts and met with EriasLukwago over six months before the nominations to have him as their mayoralcandidate but he refused.“At one time, I met with Mufti Zubair Kayongo and requested him to talk toLukwago about the Mayorship but Lukwago declined. Earlier, myself, IssaKikungwe, Mao and Vice president JB Kawanga spoke to him in vain,” Kezaalasaid. He took a swipe at the Suubi 2011 pressure group for having a tribalisticagenda blaming its members for sidelining Mao because of his tribe. The party treasurer Issa Kikungwe said the party requires a lot of money andeveryone needs to mobilize funds.HE said mobile phone users can raise 1,000/- for the party by sending an SMSto 7879. Just type the word DP and send to that code. Other networks willavail codes this week. For mobile money, the user numbers are 0776001211 or0776550077. They can also buy budges and T-shirts on which Mao’s portrait isinscribed.